I could listen to The Bad Plus until hell freezes over or the cows come home. I’ve been a fan since “Authorized Bootleg” and have seen them live whenever I could since early 2002. To me, their music doesn’t get old. Songs I’ve heard repeatedly are familiar but still fresh. Last night, in the final moments of this year’s Twin Cities Jazz Festival, they played “Dirty Blonde” as their second encore. It came out on “Give” (2004). Bring it on. It’s a trio that accepts no substitutes. Other pianists don’t sit in for Ethan Iverson, nor bassists for Reid Anderson or drummers for Dave King. But in recent years the group has added guests to the mix. In 2008, they released “For All I Care” with alt-rocker vocalist Wendy Lewis. They had wanted to work with a singer and briefly considered Tom Jones and Darryl Hall. Lewis was practically family; she and King had played together, and she’s cousin to Michael Lewis, who plays saxophone in Happy Apple, one of King’s many bands. She fit right in. A collaboration I wish I’d seen: The Badwagon, a one-off sextet comprising The Bad Plus and Jason Moran’s Bandwagon (with Tarus Mateen and Nasheet Waits) in Brooklyn’s Prospect Park in June 2011. 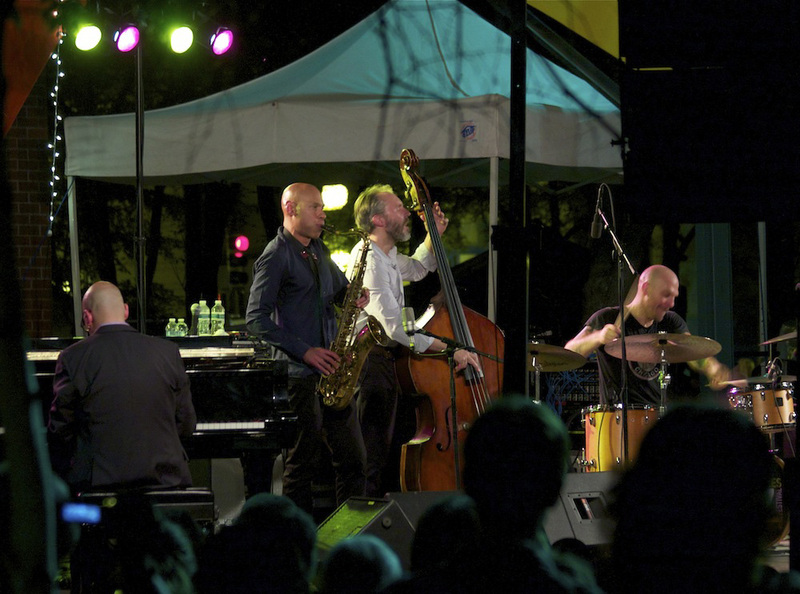 Nate Chinen called it a “conglomerated racket.” Most recently, TBP has been performing with Bill Frisell; they played together at Jazz at Lincoln Center in April and will reconvene at the Newport Jazz Festival in August. But their main “special guest” is currently saxophonist Joshua Redman, and this is the group that closed Jazz Fest and drew the biggest crowds. So, how was the show? The European audiences are in for a treat. It’s still TBP but different. Redman is a fiery, passionate player more clearly in the jazz camp than TBP. So the music is jazzier. He’s also a horn player. You almost can’t add a horn player to a piano-bass-drums trio, especially not a forceful, energetic, imaginative, dancing horn player, without the trio becoming a rhythm section backing a horn player. I say “almost” because this is TBP and they are subsumed by no one. Adding Redman expands the circle of equals from three to four. There are certainly moments when your whole attention is on Redman – as a horn player, and as an exceptional and exciting horn player – but there are just as many moments when it’s focused on Iverson, Anderson, or King, and probably more when you’re into the group sound. One thing that’s very different: by adding Redman, TBP can wail. Before, they could pound and glitter, bang and shatter and sing, but they could not wail. This, too, makes the music jazzier. The program we heard Saturday was all TBP songs, which Redman played as if he’s known them forever, or long enough to mess with them. And they were all TBP songs that have been around; so far, it seems, nothing new has been composed for The-Bad-Plus-plus-Joshua-Redman, even though all four are accomplished composers. Maybe that will happen somewhere in Europe. Maybe the group will play some of Redman’s music. “Polliwog,” a Redman-penned tune on “James Farm,” his recent CD with Aaron Parks, Matt Penman, and Eric Harland, already has more than a bit of Bad Plus bounce and attitude. Is there anywhere I could listen to this? Not that I'm aware of. But it sounds like they'll be recording before too long. 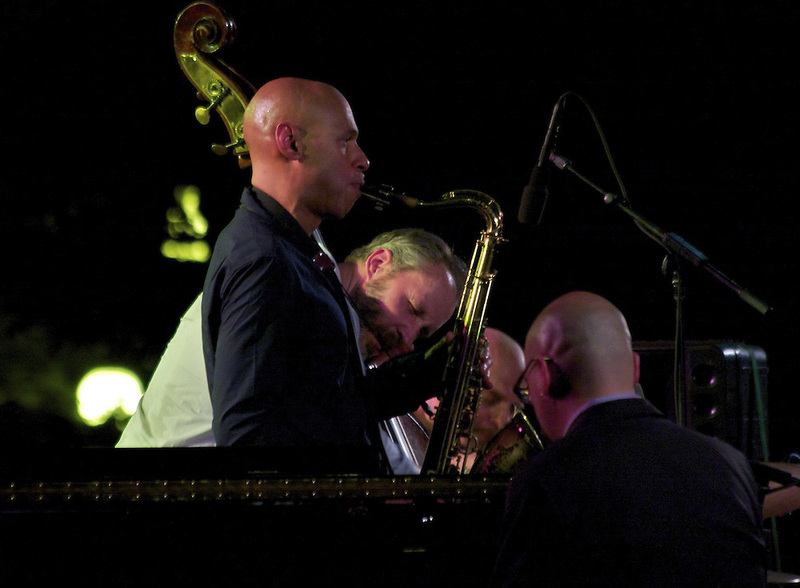 Meanwhile, there are some YouTube clips of The Bad Plus and Joshua Redman playing together.